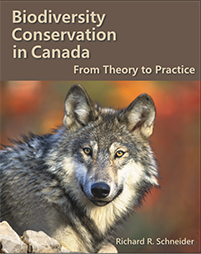 This website serves as a companion to the book Biodiversity Conservation in Canada: From Theory to Practice. A detailed description of the book can be found in the Book Overview section. The Resources section includes all of the figures and tables used in the book and provides links to cited papers. Information for ordering is available in the Purchase section. All of the information on this website is free to download and use under a Creative Commons 4.0 BY-SA licence.